I received several emails this past week from people who liked the idea of the Titanic themed dinner and wondered if I've had any other theme dinners. The answer is YES! This past May, I held a Seven Deadly Sins dinner. I wrote a post detailing that incredibly devilish night. I thought I'd re-post it for you. Enjoy! The idea, like all inspirational ideas, was simple. I was watching an episode of Top Chef, where each contestant had to create a dish inspired by one of the 7 deadly sins. Great idea, right? Except the contestants’ dishes were less than inspiring. I doubt you could get a month in purgatory for what they came up with; let alone eternal hellfire. I can do better, I thought. And not just one dish. Why not do all seven? And thus the Seven Deadly Sins Dinner was born. The first thing I had to do is figure out what these sins even were. This required a trip to Wikipedia. 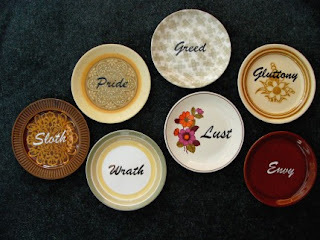 The seven deadly sins are: Envy, Gluttony, Greed, Lust, Pride, Sloth and Wrath. My overriding goal was to match the right Sin with the right Dish, slotted in the right Course. I also didn't want to make the “obvious” choices. You might expect Lust to come first, and perhaps Sloth last (as my guests could become slow and lethargic after a full meal), but I felt it would add an element of suspense if my dinner guests were never sure what was coming next. I wanted to use as many fresh ingredients as possible, and I didn't want overly complicated dishes. I wanted my guests to feel they had been to a special occasion, but not leave feeling overly full and exhausted. I chose dishes that could be served in small portions, which would allow people to take more if they so desired. My guests for this dinner were part of a loose “foodie” club we had going, meeting at each other’s houses from time to time. They were Kathy, Tim, Greg, Marg and Lynn. In particular, Kathy was a big help ahead of time, as a sounding board for different ideas, and helping me perfect my recipes. I spent about a month trying to decide what I wanted to serve, how each “sin” could be highlighted, and then another month “testing” various recipes and getting ready for the big night. The Big Night – Showtime! The night of my dinner, I had everything ready to go. I had the food preparation under control, as I was able to make a lot of it ahead of time. I set the table simply and added lots of candlelight to set the mood. Speaking of setting the mood, I went with the soft and soulful music of Norah Jones and Amos Lee on the stereo. Kathy and Tim arrived early to help me cook and they also brought the wines for each course. Kathy surprised me with printed menus to add to each place setting. At the end of the night my guests would be able to take home a souvenir of our sinful evening. My guests arrived excited, and a little nervous, as any sinners should be! I took their coats and had them gather around my living room, explaining how the dinner would run, by courses. The meal was ready to begin! the dish for the sin and some of my guests' sinful confessions. p.s. 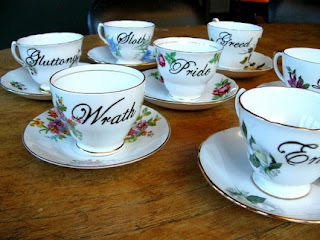 You can find out where to buy the seven deadly sins plates and tea set by clicking on their photos. I would also like to thank my dear friend, Kathy for her help in planning the dinner and for helping me with the photos. What a fun themed party! Everything looks great, well done! This is so much fun!! What a great idea. Very nicely done. Brilyn, Kristen & Susan: Thanks, Ladies! It was a fun night. Thanks Jeanne! Absinthelution is a wonderful suggestion. Although, I might have to make it an overnight party then. LOL! That's ok, because the dinner leftovers were great for breakfast. I thought the 7 deadly sins were blogs, tv, wii, ipods, digital cameras, myspace and twitter? Well, Whall, those are the "nouveau" deadly sins. :) I'm choosing to focus on the classics. Sounds like a wonderful dinner, aside from the seafood salad. I don't do seafood. But enough Sangrias and I won't even care that I'm skipping a course. Damn. You'd have had me confessing to genocide if it meant I could get my hands on some of those. Rowan: Confessions were part of the dinner, although no one confessed to genocide. That might have earned you an extra glass of wine and profiterole. An amazing idea - wonderfully executed! Ha haha, I must admit you got me there. 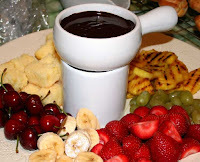 I got scared at the beginning reading your title..but as the post advance..it was ooh so yummy! Oh interesting and clever! I've enjoyed discovering your blog! Very witty, Dragon! I've never even thought about having a properly themed dinner, and I think it's high time I do. You know this has the makings of a seven-part blogging event (hint, hint). By the way, I love your dishes - where did you find the pretty tea set? Wow, what a fun post!! SO creative! I love it! Oh wow! That is one party I would like to attend. What would the devil cook? LOL I love it :) Great recipes and pictures. What a fun idea for a dinner party! I remember that Top Chef, and wondered where they came up with some of their ideas. Your whole dinner sounds great! My..my..., When is the next party? My favorite is your pride course!!! I love you dragon. This sounds scrumptious. I am definately going to do this menu and you shall get full credit. Husband and I are in a Gourmet Club. (who'da thunk it, ME? lol shows ya'll how deep I really am :-) )Perhaps I should post some of the themes and menus for all to see also. Thanks for the smart menu! I love themed dinners and partys! I've got so excited just reading this; may have to steal your idea, I think XD. Love the dishes and cups too, heh. Do you hear me clapping all the way from Spain? Bravo, bravo, bravo!!! A brilliant post! 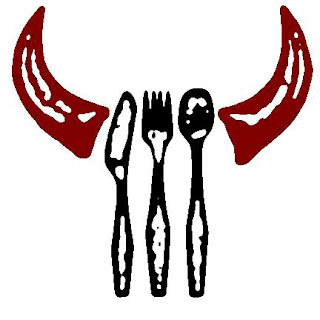 With wonderful food, fantastic idea and so nicely and perfectly explained and showed! I have no more words left! I might copy your idea with some friends!!!! Amazing. The amount of time and energy you took putting this together! You should repost it once a month!!! Next time I want an invite! I sure would like to be on your guest list! kittie: It is a lot of fun and if I can do it, you can too. dee: Those are the best sins! If you click on the dish photos, it will take you to the site where you can buy them. deborah: Top chef is addictive, isn't it? doo dah: Welcome back, baby! Thank you. Let me know how your dinner goes. I want to hear all about it. :) And I want to see all the themes and menus from your club. jen: Yes they do! And thank you. nuria: I think I can hear you clapping. Thanks you, my friend. Let me know how the dinner turns out for you. dawnielle: Thank you, Babe! Repost every month? Well that would make my life easier these days. :) I've been extremely busy with work that I haven't posted as often as I'd like. madam: You'd be welcome anytime, my friend. OMG!!!! This blows my mind! I loved it, the names of the dishes and conections, the introduction, everything! Just great! You certainly know how to throw a party don't you!! Come visit me I have an award for you. Wow, a brilliant idea and such a great meal! although I don't think I could follow it through! Looks amazing. You did a much better job coming up with food to match the sins than the Top Chefs did! Brava! This looks like it was so much fun! I just love your blog...and I was in Waterloo just 2 weekends ago. I've always wanted to do a seven deadly themed meal. I really like the aged cheeses for sloth. I just found your blog and the page about the 7 deadly Sins dinner! The whole thing is very inspiring! I think i will try it and of course give you credit for it. I will let you know! PS: I may be wrong but it seems to me that the 7 sins you have used for your theme are Venial sins, not Deadly sins. This way we can all feel no so sinfull!! But then again, all sins can be excused! I love theme parties! What a fantastic idea!!! So creative! Thanks for sending me a link to this post; it is brilliant! Yes, the food looks amazing, but the idea truly is wickedly fun! I guess I need to try harder! Wow. What a wonderful idea. I just called my husband all excited about this and my husband is so excited to do a themed dinner party like this! I'm going to do this party soon adn then try to come up with my own themed party! This is a great great idea!! I <3 that I found this blog! A wonderfully unique party! Brilliant! Wish I could have been part of it. Wow! I want to come to a party at your house! I'm speechless with greed and envy. I want to party at YOUR HOUSE! Cool idea! Also really enjoyed your Titanic dinner pictures! Gearing up for my own!